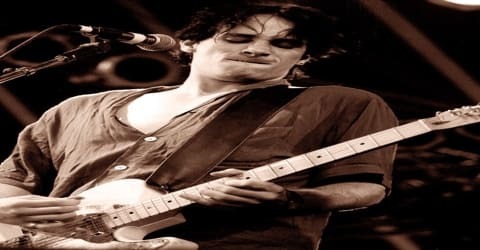 Jeff Buckley – American singer, songwriter, and guitarist. 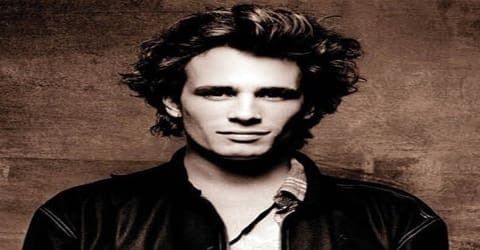 American folk, rock, and pop singer and songwriter, Jeff Buckley was born on November 17, 1966, in Orange, California, United States. Buckley was the only son of Mary Guibert and folk musician Tim Buckley. After a decade as a session guitarist in Los Angeles, Buckley amassed a following in the early 1990s by playing cover songs at venues in Manhattan’s East Village, such as Sin-é, gradually focusing more on his own material. After rebuffing much interest from record labels and his father Tim Buckley’s manager Herb Cohen, he signed with Columbia, recruited a band, and recorded what would be his only studio album, Grace, in 1994. The son of American music legend Tim Buckley, Jeff grew up in a musical environment, singing around the house and in harmony with his mother. He decided to become a musician when he was 12 years old. After completing his education, he worked in a hotel for the next six years and served as a guitarist in numerous struggling bands. He spent almost a decade as a session artist in Los Angeles and later accumulated a relatively large and loyal fanbase, covering various songs at venues in Manhattan’s East Village. After making a slow transition to playing his own original material, Buckley drew attention from multiple record labels. He turned them all down and eventually signed with Columbia. Soon after, a band was formed around him and in 1994, his first and only studio album ‘Grace’ was released. He was working on a planned second album, ‘My Sweetheart the Drunk’ when he drowned while swimming fully clothed in the Mississippi River. Since his death, many of his songs have been released and they have been well-received by critics and fans alike. The music press often ranks him in lists of the greatest musicians of all time. Buckley’s voice was grand and sweeping, which fit with the mock-operatic grandeur of his Van Morrison-meets-Led Zeppelin music. His audacious debut, Grace, made him one of the most popular alternative artists of the ’90s, accentuated by his early and tragic death in 1997, and his cover of Leonard Cohen’s “Hallelujah” virtually redefined the song for a modern audience. Since his death, there have been many posthumous releases of his material, including a collection of four-track demos and studio recordings for his unfinished second album My Sweetheart the Drunk, expansions of Grace, and the Live at Sin-é EP. Chart success also came posthumously: with his cover of Leonard Cohen’s song “Hallelujah” he attained his first number one on Billboard’s Hot Digital Songs in March 2008 and reached number 2 in the UK Singles Chart that December. Buckley and his work remain popular and are regularly featured in “greatest” lists in the music press. 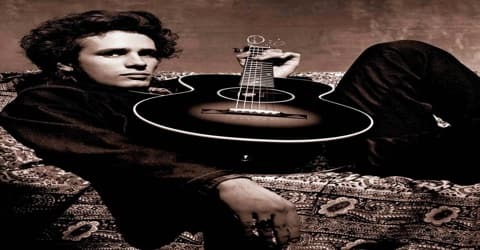 Jeff Buckley, by name Jeffrey Scott Buckley, was born on November 17, 1966, in Orange, California, the U.S. His biological father Tim Buckley and his mother, pianist and cellist Mary Guibert didn’t really have a relationship before or after Jeff was born. He met his father only once in his life, at eight years of age. Tim died of a drug overdose in 1975. Buckley was raised by his mother and stepfather, Ron Moorhead, in Southern California, and had a half-brother, Corey Moorhead. Buckley moved many times in and around Orange County while growing up, an upbringing Buckley called “rootless trailer trash.” As a child, Buckley was known as Scott “Scottie” Moorhead based on his middle name and his stepfather’s surname. Buckley was raised in a musical household. His stepfather, while not a professional musician himself, was a devoted fan of contemporary music, and through him, Buckley learned about Led Zeppelin, Queen, Jimi Hendrix, The Who, and Pink Floyd at an early age. He began playing guitar at the age of five. Led Zeppelin’s Physical Graffiti was the first album he ever owned; the hard rock band Kiss was also an early favorite. At the age of 12, he decided that he would one day become a musician. He was gifted his first electric guitar, a black Les Paul, at the age of 13. He studied at Loara High School and joined the school’s jazz band. During this time, he developed an affinity for progressive rock bands such as Rush, Genesis, and Yes, as well as jazz fusion guitarist Al Di Meola. After graduating from high school, he moved north to Hollywood to attend the Musicians Institute, completing the one-year course at the age of 19. Buckley later told Rolling Stone the school was “the biggest waste of time”, but noted in an interview with Double Take Magazine that he appreciated studying music theory there, saying, “I was attracted to really interesting harmonies, stuff that I would hear in Ravel, Ellington, Bartók.” In the following six years, Buckley played guitar and did backing vocals for several struggling bands, spanning a diverse range of styles from jazz, reggae, and roots rock to heavy metal; He also toured with the dancehall reggae artist Shinehead. Jeff Buckley had a whirlwind romance with Scottish singer Elizabeth Fraser in the mid-1990s. Smitten by her rendition of one of his father’s songs, he took the initiative to contact her in 1994. At the time, he was working on the release of his only album, ‘Grace’. They broke up sometime in 1995. Buckley and Fraser recorded a song together titled ‘All Flowers In Time Bends Towards The Sun’, but it wasn’t released until the 2000s. Buckley spent the next six years working in a hotel and playing guitar in various struggling bands playing in styles from jazz, reggae, and roots rock to heavy metal. He toured with the dancehall reggae artist Shinehead and also played the occasional funk and R&B studio session, collaborating with fledgling producer Michael J. Clouse to form X-Factor Productions. Throughout this period, Buckley limited his singing to backing vocals. In February 1990, Buckley moved to New York City, where he first experienced Qawwali, a form of Sufi devotional music primarily from India and Pakistan. He became an ardent admirer of Nusrat Fateh Ali Khan and did covers of many of Khan’s songs during his “cafe days”. He went to Los Angeles when his father’s former manager Herb Cohen promised to help him record a demo of his original songs. Titled ‘Babylon Dungeon Sessions,’ the demo was made hoping that it would garner interest from the city’s music industry. Finding few opportunities to work as a musician, Buckley returned to Los Angeles in September when his father’s former manager, Herb Cohen, offered to help him record his first demo of original songs. 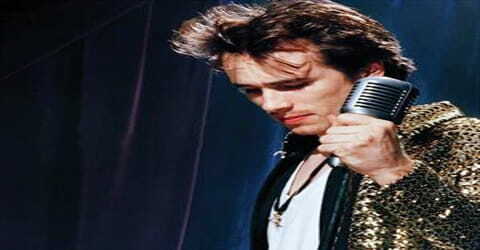 Buckley completed Babylon Dungeon Sessions, a five-song cassette that included the songs “Eternal Life” and “Unforgiven” (later titled “Last Goodbye”. Cohen and Buckley hoped to attract attention from the music industry with the demo tape. During this period, Buckley and guitarist Gary Lucas performed at a tribute concert for Tim Buckley. Jeff sang one of his father’s songs, ‘I Never Asked to Be Your Mountain’, which was originally written for Jeff and his mother. Jeff used the song to pay his last respects to his departed father. Buckley began a solo career playing clubs and coffeehouses, building up a considerable following. Soon, he signed a record deal with Columbia Records, releasing the Live at Sin-e EP in November of 1993. It received good reviews, yet they didn’t compare to the raves Buckley’s full-length debut, 1994’s Grace, received. Unlike the EP, the album was recorded with a full band, which gave the record textures that surprised some of his longtime New York followers. Nevertheless, it made several year-end “Best of 1994” lists and earned him a belated alternative hit, “Last Goodbye,” in the spring of 1995. In late 1991, Buckley was briefly part of Lucas’ band Gods and Monsters and performed around New York City with them. After leaving the band, he garnered modest fame by performing at several clubs and cafés around Lower Manhattan, including the legendary Sin-é in the East Village. These performances helped him to not only develop a loyal fan base but also attract attention from record label executives. Buckley began performing at several clubs and cafés around Lower Manhattan, but Sin-é in the East Village became his main venue. He first appeared at Sin-é in April 1992 and quickly earned a regular Monday night slot there. His repertoire consisted of a diverse range of folk, rock, R&B, blues and jazz cover songs, much of it music he had newly learned. During this period, he discovered singers such as Nina Simone, Billie Holiday, Van Morrison, and Judy Garland. Buckley performed an eclectic selection of covers from a range of artists from Led Zeppelin, Nusrat Fateh Ali Khan, Bob Dylan, Édith Piaf, Elton John, the Smiths, Bad Brains, Leonard Cohen, Robert Johnson, and Siouxsie Sioux. Original songs from the Babylon Dungeon Sessions and the songs he’d written with Gary Lucas were also included in his set lists. He performed solo, accompanying himself on a borrowed Fender Telecaster. Buckley stated that he learned how to perform onstage from playing to small audiences. Over the next few months, Buckley attracted admiring crowds and attention from record label executives. Buckley signed with Columbia Records, home of Bob Dylan and Bruce Springsteen, for a three-album, essentially million-dollar deal in October 1992. Recording dates were set for July and August 1993 for what would become Buckley’s recording debut, an EP of four songs. Live at Sin-é was released on November 23, 1993, documenting this period of Buckley’s life. Following the release of ‘Grace’ in 1994, Buckley embarked on an international tour to promote the album. He traveled to Australia, U.K., the Scandinavian countries, France, and several other Western European countries and performed live before his fans there. In October 1994, he began a tour of the US and Canada. He also visited Japan and New Zealand. Grace was released on August 23, 1994. In addition to seven original songs, the album included three covers: “Lilac Wine”, based on the version by Nina Simone; made famous by Elkie Brooks, “Corpus Christi Carol”, from Benjamin Britten’s A Boy was Born, Op.3, a composition that Buckley was introduced to in high school, based on a 15th-century hymn; and “Hallelujah” by Leonard Cohen, based on John Cale’s recording from the Cohen tribute album, I’m Your Fan. His rendition of “Hallelujah” has been called “Buckley’s best” and “one of the great songs” by Time, and is included on Rolling Stone’s list of “The 500 Greatest Songs of All Time”. On New Year’s Eve 1994-95, Buckley returned to Sin-é to perform a solo set; on New Year’s Day, he read an original poem at the annual St. Mark’s Church Marathon Poetry Reading. Two weeks later, he and his band were back in Europe for gigs in Dublin, Bristol, and London before launching an extensive tour of Japan, France, Germany, Italy, Holland, Belgium, and the United Kingdom which lasted from January 29-March 5. 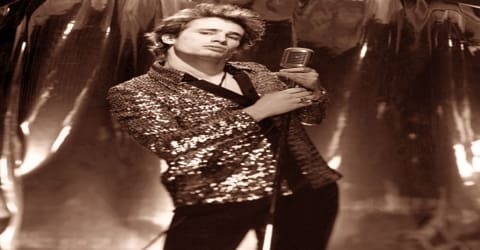 On April 13, 1995, it was announced that Jeff Buckley’s Grace had earned him France’s prestigious “Grand Prix International Du Disque Academie Charles CROS 1995”; an award given by a jury of producers, journalists, the president of France Culture, and music industry professionals, it had previously been given to Edith Piaf, Jacques Brel, Yves Montand, Georges Brassens, Bruce Springsteen, Leonard Cohen, Bob Dylan, Joan Baez, and Joni Mitchell, among other musical luminaries. France also awarded Buckley a gold record certification for Grace. In 1995 Buckley played a concert at the Paris Olympia, a venue made famous by the French vocalist Édith Piaf, that he considered the finest performance of his career. Sony has since released a live recording of that performance. Much of the material from the tours of 1995 and 1996 was recorded and has been released posthumously on albums such as Mystery White Boy and Live an l’Olympia. An impassioned fan of Pakistani Sufi musician Nusrat Fateh Ali Khan, Buckley often covered his songs during his café tours. In 1996, having finished touring, Buckley started to work on his second album, ‘My Sweetheart the Drunk’. However, he was unhappy with the initial material recorded and continued to refine the sound. The album was never completed and was released after Buckley’s death, on May 26, 1998. Despite being unfinished, it was well-received by the critics. On February 4, 1997, Buckley played a short set at The Knitting Factory’s tenth-anniversary concert featuring a selection of his new songs: “Jewel Box”, “Morning Theft”, “Everybody Here Wants You”, “The Sky is a Landfill” and “Yard of Blonde Girls”. Lou Reed was there to watch and expressed an interest in working with Buckley. The band played their first gig with Parker Kindred, their new drummer, at Arlene’s Grocery in New York on February 9. The set featured much of Buckley’s new material that would appear on Sketches for My Sweetheart the Drunk and a recording has become one of Buckley’s most widely distributed bootlegs. Later that month, Buckley recorded a spoken word reading of the Edgar Allan Poe poem, “Ulalume”, for the album Closed on Account of Rabies. This would be his last recording in New York; shortly after, he moved to Memphis, Tennessee. A collection of unreleased recordings, Sketches for My Sweetheart the Drunk, appeared in 1998, and two live albums arrived during 2000-2001, Mystery White Boy and Live an l’Olympia. 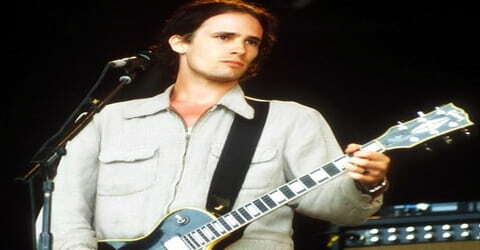 Over the next decade and a half, other posthumous records appeared the compilation So Real: Songs from Jeff Buckley in 2007, the live album Grace Around the World in 2009, but the biggest excavation from the vaults was 2016’s You and I, which presented cover versions the singer/songwriter had recorded early in his career. On April 13, 1995, Jeff Buckley received the Grand Prix International Du Disque from The Académie Charles Cros for ‘Grace’. In 1998, Buckley was nominated for a Grammy Award for Best Male Rock Vocal Performance for his song Everybody Here Wants You and in 2000, music television station VH1 included Buckley’s album Grace in the “100 Greatest Albums of Rock and Roll,” ranked at No. 73. In 2006, Mojo named Grace the No. 1 Modern Rock Classic of all Time. It was also rated as Australia’s second favorite album on My Favourite Album, a television special aired by the Australian Broadcasting Corporation on December 3, 2006. ’Grace’ was ranked at number 303 in Rolling Stone’s 2003 list of the 500 Greatest Songs. His cover of ‘Hallelujah’ was ranked at number 259 on Rolling Stone’s 2004 list of 500 Greatest Songs. Buckley himself was listed at number 39 among the 100 Greatest Singers of All Time by the magazine in 2008. 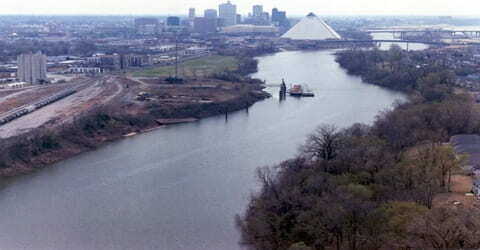 On the evening of May 29, 1997, Buckley’s band flew to Memphis intending to join him in his studio there to work on the newly written material. The same evening, Buckley went swimming in Wolf River Harbor, a slack water channel of the Mississippi River, while wearing boots and all of his clothing and singing the chorus of the song “Whole Lotta Love” by Led Zeppelin. This wasn’t the first time that Buckley had gone swimming there. Keith Foti, a roadie with his band, accompanied him that evening but remained ashore. He was busy keeping the radio and guitar they had brought with them dry when he realized that Buckley had vanished. A rescue effort was launched by the authorities on the same night, but Buckley could not be found. On 4 June, his body was discovered in the Wolf River near a riverboat. After an autopsy, drug overdose was ruled out and the investigators concluded that he had died of accidental drowning. After Buckley’s death, a collection of demo recordings and a full-length album he had been reworking for his second album were released as Sketches for My Sweetheart the Drunk – the compilation being overseen by Chris Cornell. Three other albums composed of live recordings have also been released, along with a live DVD of a performance in Chicago. A previously unreleased 1992 recording of “I Shall Be Released,” sung by Buckley over the phone on live radio, was released on the album For New Orleans. 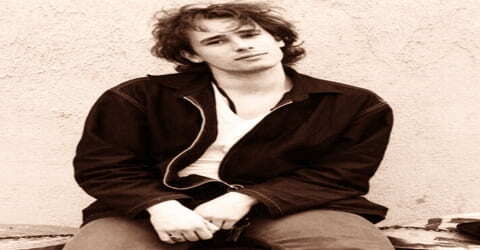 Jeff Buckley began collaborating with record producer Andy Wallace in mid-1993 for his debut album. After organizing a band that included bassist Mick Grøndahl and drummer Matt Johnson, he also brought in guitarist Gary Lucas to work on the singles ‘Grace’ and ‘Mojo Pin’ with him. His debut album ‘Grace’ was released on August 23, 1994, and had six songs including ‘Grace’ and Buckley’s cover of Leonard Cohen’s ‘Hallelujah’. The album went on to become a major hit across the globe.